Here Here for Beer Bread! So, The Boy, our oldest son, Jack, will be leaving for college in approximately a year and a half. I’m starting to panic. Don’t get me wrong. I want him to go. I remember the words my mother said to me as my high school graduation was approaching, “I’m so sad you are leaving. But I’d be sadder if you were staying.” It was time. She knew it. And I knew it. I feel the same way about The Boy. I will miss him everyday, but I want him to go on and experience new things. And of course I want him to move toward an independent, happy life. Still, I find myself feeling a little desperate as the time grows shorter and shorter. Have I taught enough lessons? Have I said enough prayers? Have I cooked enough meals to make him mildly homesick when he’s at college? Just the other day, I assured him that I would visit him at school and bring some home-cooked meals. His reply? “I don’t get that many home-cooked meals now.” WHAT? IS HE JOKING? IS THIS SOME SORT OF TEEN REBELLION DESIGNED TO PUT DISTANCE BETWEEN US? IS HE TRYING TO KILL ME? I can assure you. I cook – well and often. The thing is we live in the South. Here people associate home cookin’ with fried chicken, fried fish, fried okra, fried pies, fried potatoes…you get the idea. I do occasionally make a mean biscuits and gravy, another southern staple. But I don’t do fried. I love fried food, I just don’t tend to fix it – my mother was the same way. Anyway, after The Boy’s cutting remark, I have turned up the heat, literally in my kitchen. I’m still not frying much, but I am making a whole slew of other homemade goodies, cookies, pies, brownies. Last week I made a pot of potato soup and a pot of chicken noodle soup. And what goes better with homemade soup than homemade bread? 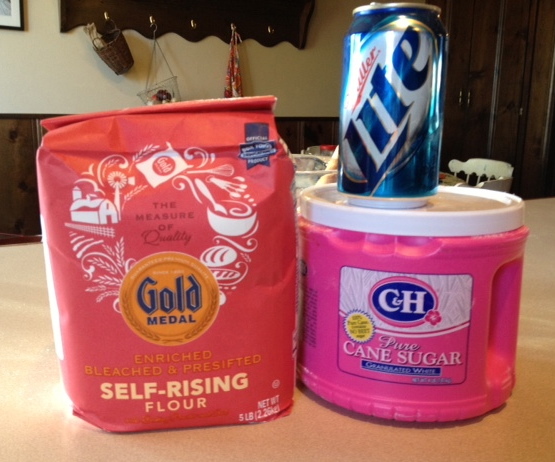 Luckily I remembered my Daddy’s recipe for beer bread. I don’t know if this is one of those recipes that everyone knows, but it should be. 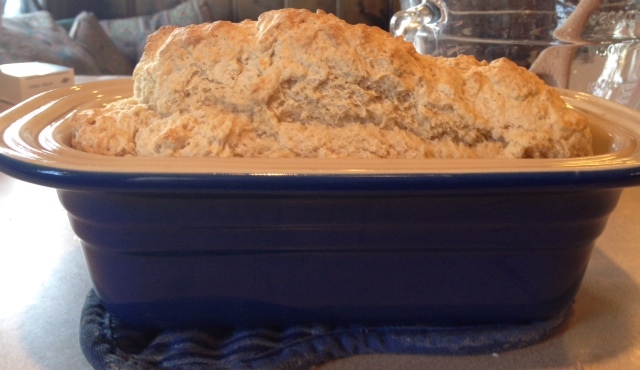 It’s such a quick and easy way to have homemade bread any night of the week. It isn’t ideal for sandwiches, but it’s perfect as a side or with a bowl of soup! And it only has three ingredients! Mix four and sugar together. Slowly mix in the beer. Let stand for about ten minutes. Bake a 350 for 50-60 minutes. When you take it out of the oven you can run an stick of butter over the top for added yumminess. I certainly hope The Boy sees the errors of his ways. I do cook. Homemade bread proves it. And so will the extra pounds we will all gain in order for me to make my point! I feel the same way about my boys – I know it will be hard to let them go and I am sure that as we get closer to that stage it will be wierd. In the same breath I wouldn’t want it any other way. If they never wanted to leave I would feel I had done something wrong. At this point, he wants to go, but not too far (within four or five hours from home). I’m good with that. And I will have ot leave the bread making to my husband – he loves making bread and other goodies. I am just not that kind of girl…………or maybe I am but I have enough on my plate. Maybe I will be that later in life when I am tryign to entice the boys home for a visit. I might have overstated my case. I can cook, but I don’t do it everyday. Many many nights my husband cooks or we have “jump up” (jump up and get yourself something to eat. Last night The Boy cooked. It was yummy. What?! You mean there is a time when they are going to leave home?!!!! Who will cook for me then? !